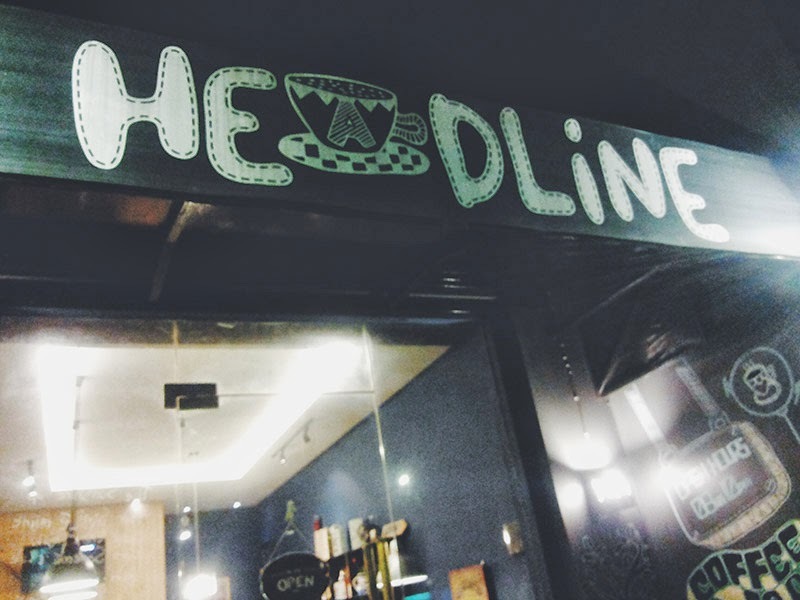 This post is about my little visit to Headline Coffee Shop Kemang (Headline Espresso and Brew Bar). 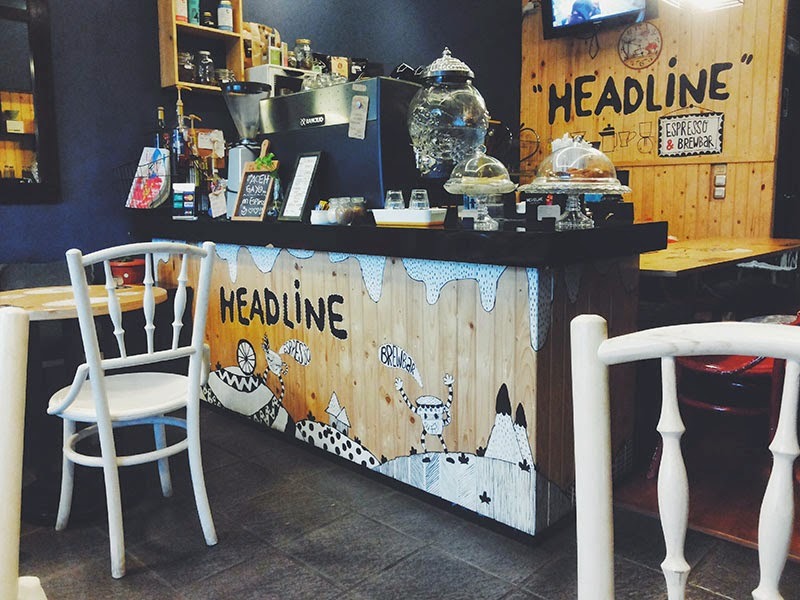 Headline Coffee Shop located at Jalan Kemang Utara Raya No. 50 Jakarta, Indonesia. 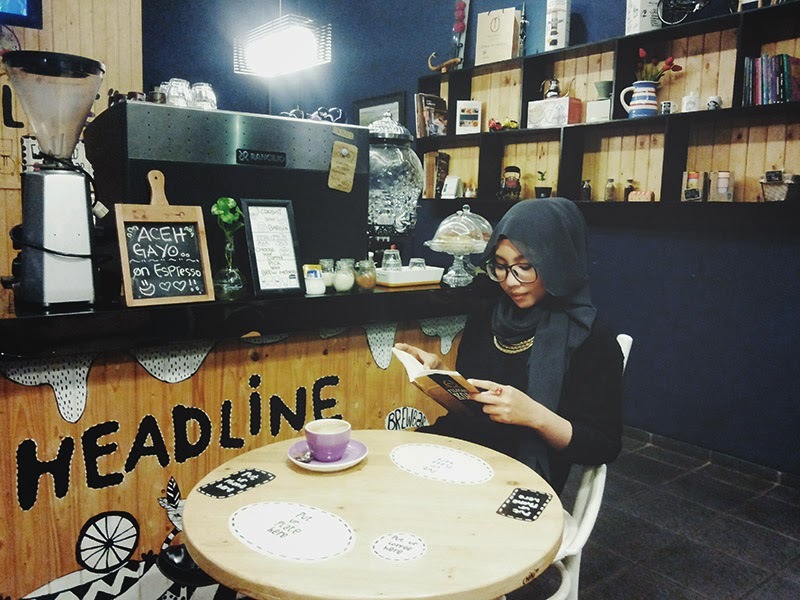 You can find coffees from different Indonesia regions and foreign country at Headline Coffee Shop. That day, I would love to try the Arabica Solok Coffee, a less known arabica coffee from West Sumatra. Unfortunately I have not eaten any foods since morning, just sipped a glass of hot milo, so I decided not to try any black coffee at Headline coffee and ordered a green tea instead. Which means I have to visit this espresso and brew bar again next time. So, here I am, 2 weeks without no update, eh? Although I've got so many good news to share, but I just feel like I don't have mood to make any sentences to describe my pictures. All pictures at this post been uploaded like a week but I kept them at my blog draft. Feels like I run out of any words to write even a short blog post one. Currently my life was too excited that I even hard to describe it. Traveling projects, fashion projects, thesis project, met up with old friends, family time, me time, teaching kids, etc. I couldn't stop saying Alhamdulillah (Thank Allah) and praised Allah, I felt so blessed of being me. 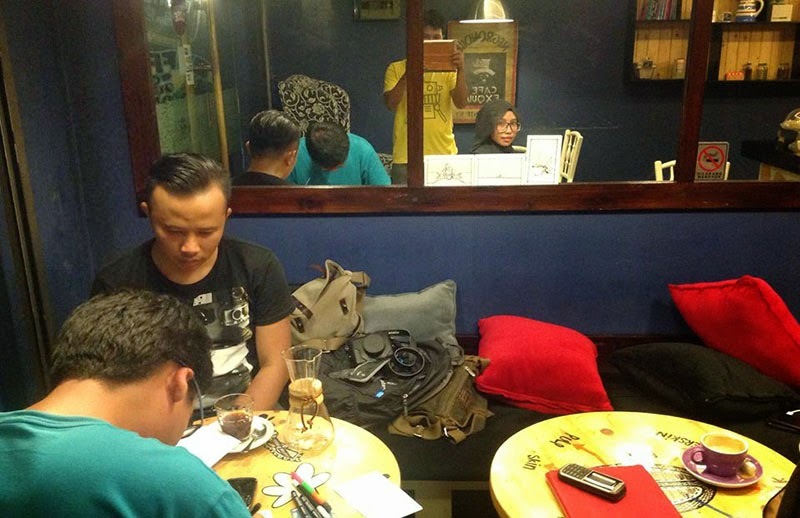 Just like this time, I met Bang Allan and Bang Andri at Headline Coffee Shop, my old friends when I was taking my bachelor degree at Padang, West Sumatra. He came to Jakarta for some projects with his friends Bang Ulil and Bang Fajar. They are all are awesome photographer. We talked a lot about how to read and create a good photograph visually. 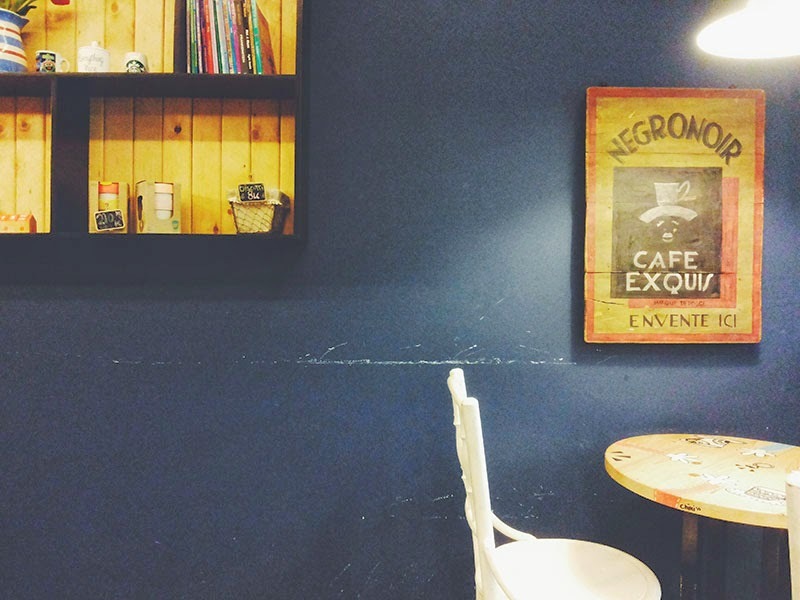 Anyway, I really love the design of Headline Coffee Shop, especially their dark blue walls combined with colours from wood materials and cute hand drawings spreads on their round tables and counter area. I also love that Headline Coffee provided some books at their shop. 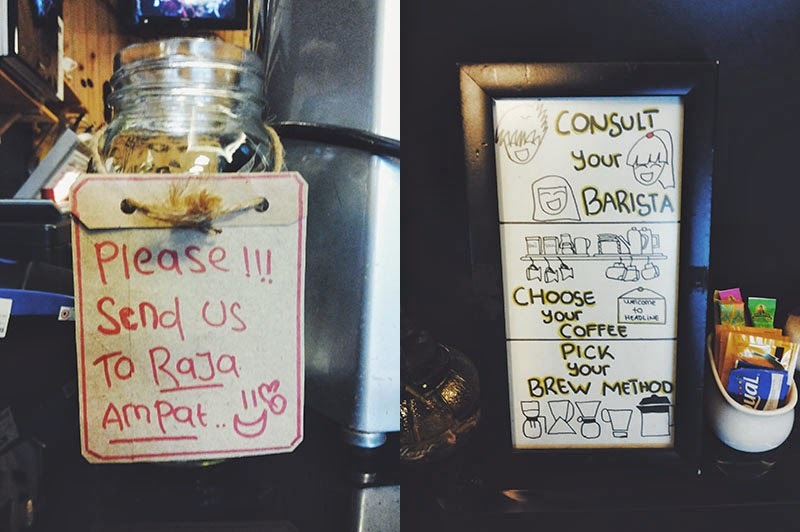 The words written on the tip jar also my favourite, "Please!!! Send us to Raja Ampat :)". 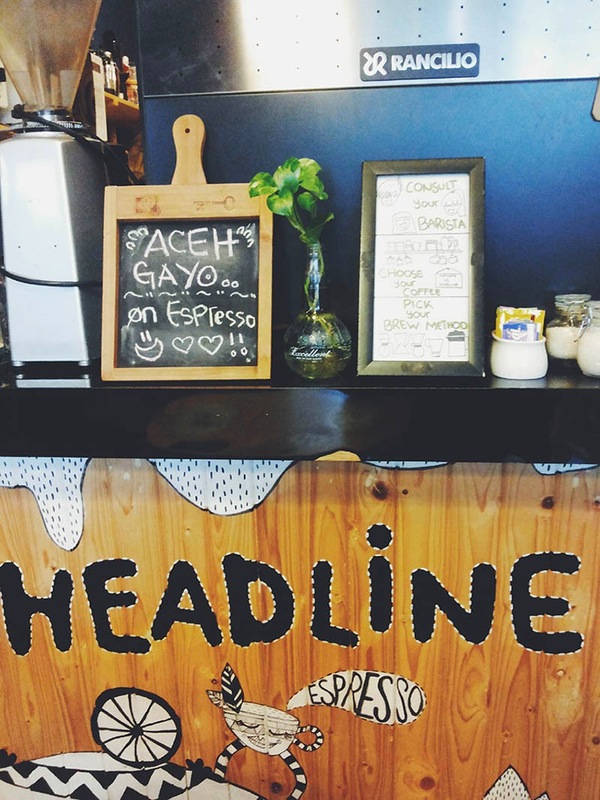 FYI, Headline Coffee open from 8.00 am to 10.00 daily. You also can enjoy sipping your coffee while listening to good music and surfing at your favourite websites. They also provides foods and cakes. 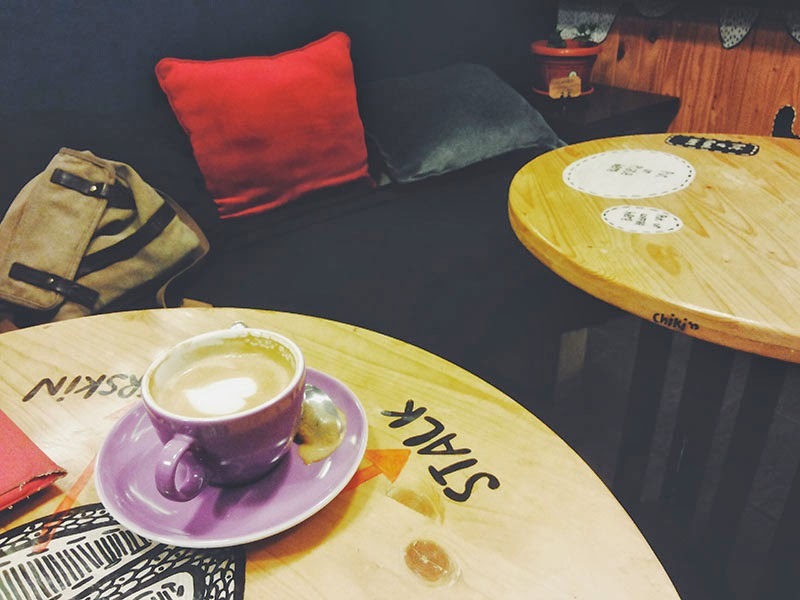 Such a perfect place to meet friends, colleagues, and family or having "me time" with yourself. Of course I stay tuned! Though I wonder whether it as as great to old people as it obviously is to Bohemian youngsters. This place looks amazing and the photographs are so lovely. 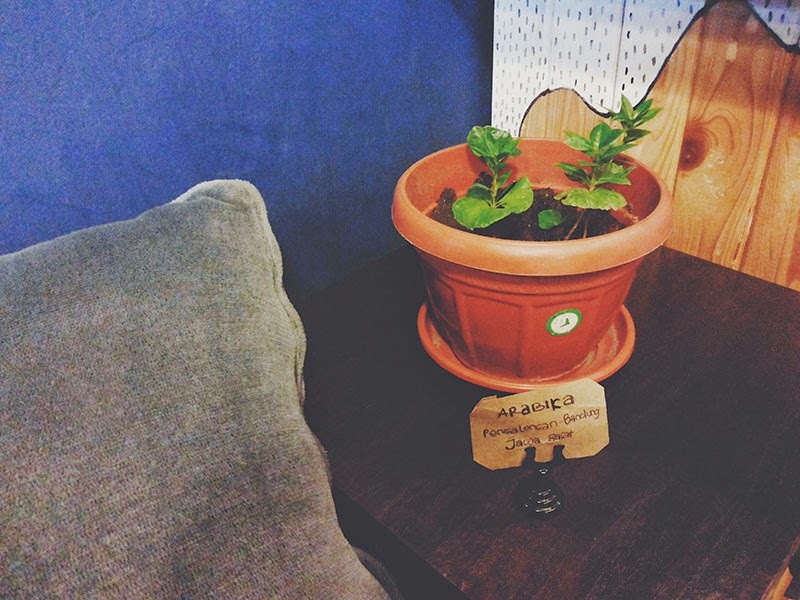 Lovely place, so cosy and funny at the same time! Ini Nadya, temennya Iwed yg ketemu di IFW waktu onoh. Ih kece banget deh blognya, suka banget. And your photos look really great loh. Kapan2 dong kita adain project bareng gituu.